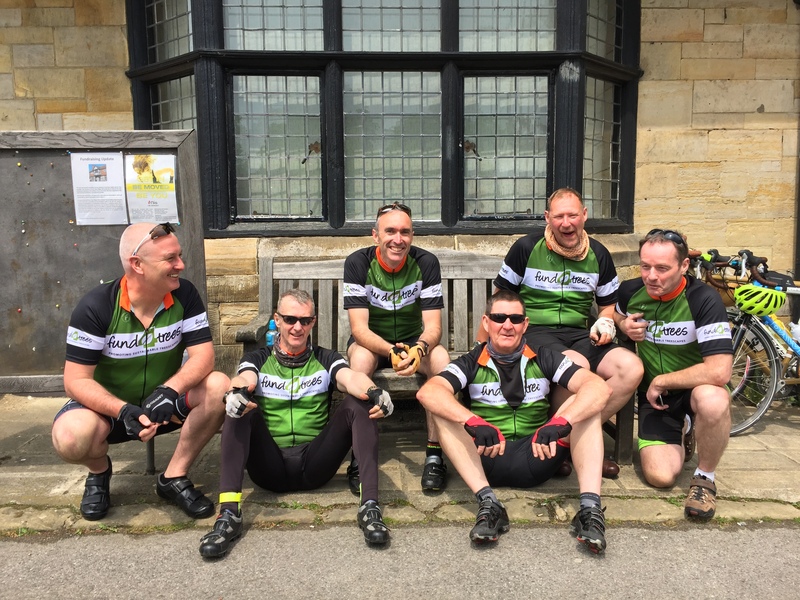 Many of you reading this will be familiar with the Fund4Trees (F4T) charity which Russell Ball founded, and it’s annual Ride for Research (RfR) cycling events. These events are for people who work in the arboricultural and forestry sectors and involve cycling a short tour, and en route visiting schools and communities to plant trees and raise awareness about their importance. 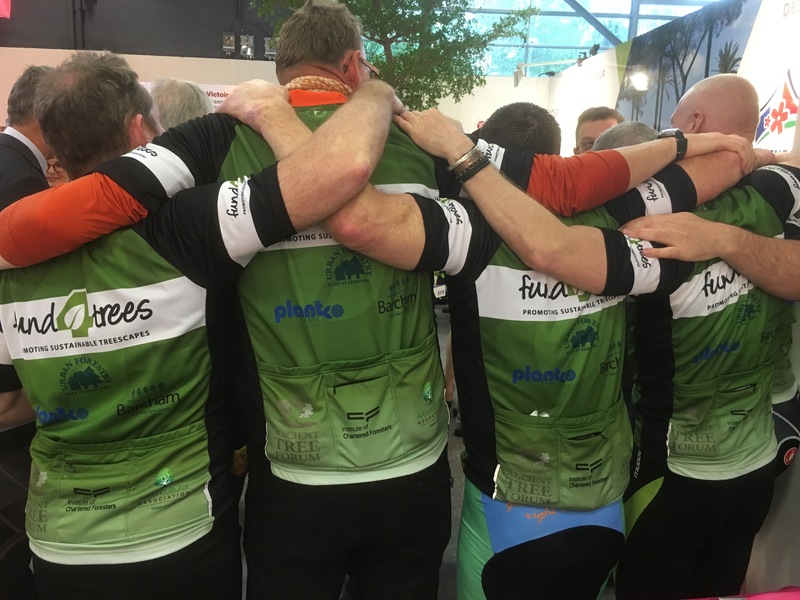 The riders gain sponsorship for the event, and the money raised is used to support and advance research about trees and to also promote sustainable treescapes. To his credit, Russell has taken this a stage further, and has completed some solo journeys where he has cycled from Land’s End to John O’Groats, and also to every capital city in the UK. So, when Russell suggested that he wanted to ride to Paris, I thought it sounded like a brilliant opportunity to do something different, and just the excuse I needed to join the burgeoning crowd of MAMIL’s (middle-aged men in Lycra) that you see out everywhere on the roads these days. The focus of this ride was slightly different to the others, and involved delivering a French translation of the ‘Trees in Hard Landscapes: A Guide to Delivery’ to the 99th French Mayors Congress in the Porte de Versailles Exhibition Centre in the west of Paris. This important document was initially published in 2014 by the Trees and Design Action Group (TDAG). The document explores the practical challenges and solutions for integrating trees in the 21st century streets, civil spaces and car parks. Arguably these are some of the most challenging environments for trees to grow in, but areas that can derive the most benefits for their inclusion. The publication has received widespread endorsement from an unprecedented cross-disciplinary partnership in the UK, and quickly attracted attention from across the channel. As a result, VAL’HOR stepped in to sponsor the French translation. Delivering the document by hand and by bicycle from England, was therefore of great symbolic importance. Coupled with this for the whole journey, Russell transported a young Oak tree in his panniers, grown from the acorn of a 1000 year old tree from Windsor Great Park, which was gifted by the Crown Estate. Ted Green the founder of the Ancient Tree Forum, was kind enough to arrange this on behalf of the riders, and for also having the tree expertly propagated by Pete Wells, of Barcham Nurseries fame. As there have been a number of RfR events in the past, Russell and the F4T Trustees were concerned that colleagues and friends who were asked to make regular donations to sponsor these RfR events, may gradually start to suffer from ‘charitable donation fatigue’. So this year, another aim of the ride was to promote Donate1Hour and Donate1Job. The idea behind this is to encourage employees to give the equivalent of an hour of their time per month (via PAYEE) to the charity, and for businesses to do something similar with an annual donation: equivalent to one job/project. It is hoped that this may be a more attractive and sustainable way for people to give and can be proportionate to their income. As you can imagine, the ride started to attract a lot of interest and gained the attention of key people throughout the arboricultural and forestry industries. 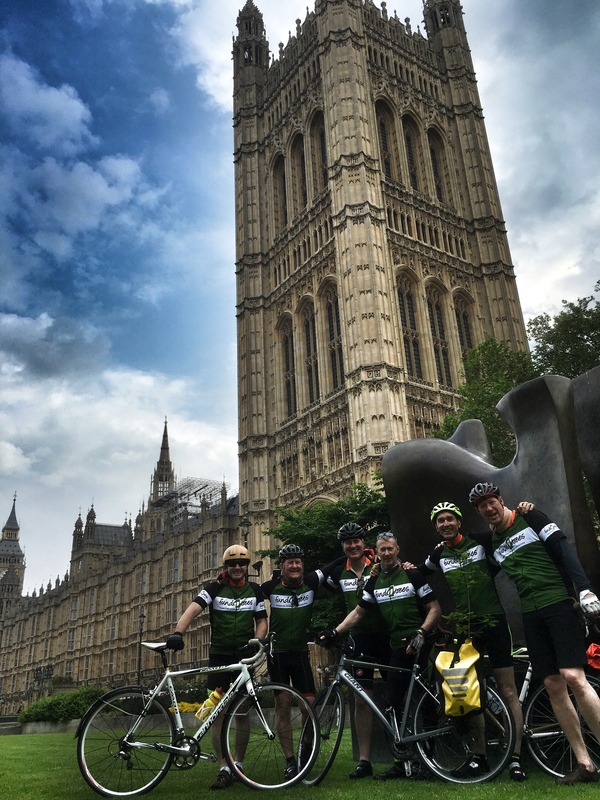 We were very lucky to gain the support of Lord Framlingham, who met the riders at the Houses of Parliament several weeks before the ride, to wish us well, and to also comment on what an effective collaboration it was by all those concerned (read more). Following this, and just 24 hours before the ride started , we were also privileged to gain the attention of the new Mayor of London, Sadiq Kahn, who took time out of his busy schedule to have his photo taken with the Windsor Oak sapling and four of the riders. It seemed very fitting, that we were going to transport the document and tree from the hand of the Mayor of London, into the hand of a Parisian Mayor (with quite a bit of pedaling in between!) – read more. Providing back up and driving a support vehicle was Robin Taylor, a keen cyclist from Suffolk. Barcham Nursery generously donated the supply of this vehicle. Other ride expenses were also generously covered by Plantco (France). Our aim was to get to the coast at Newhaven in one day, to then catch the ferry to Dieppe the following morning. This ride was just short of 80 miles, and encompassed riding through several London Boroughs, and dodging the Bank Holiday traffic. We had gorgeous warm weather throughout the journey, and especially enjoyed the roller coaster ride through the Ashdown Forest. Mick Boddy and I managed to get broken up from the main group of riders, and decided to wait for them at a key strategic point. Ironically, we met several runners who were taking part in an ultramarathon (75 miles) whilst we were waiting, and were able to help them with directions. It wasn’t until we had waited for about half an hour that we realised we had taken a wrong turning, and we were the ones that were actually lost! We had to peddle frantically up several horrible hills, to meet the team in Lewes, who by this time were all supping coffee and gorging on cake. After a quick look round Lewes to see if we could find Keith Sacre (who lives there, and had been due to join the ride, but had to bow out due to injury at the last-minute), we then set off for Newhaven, where we stayed overnight and enjoyed a local pub. 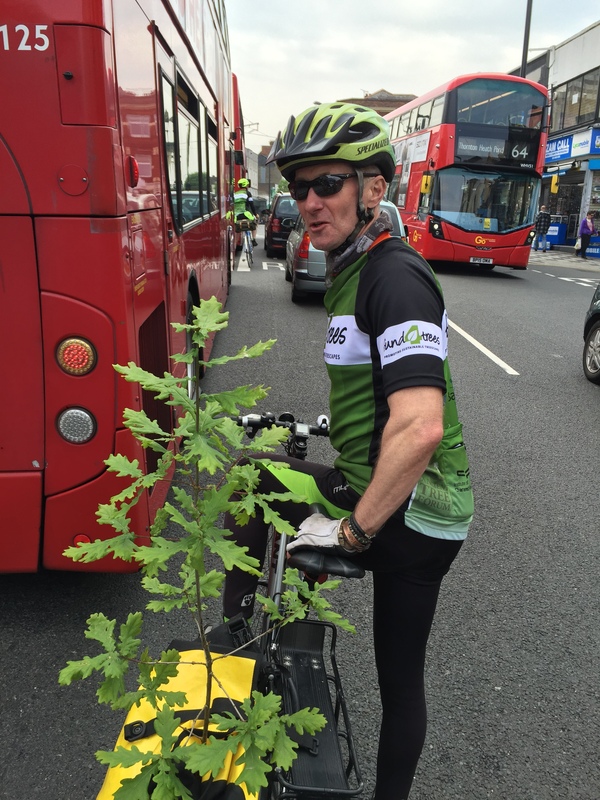 Fund4Trees – London to Paris 2016: a relaxing break in sunny England. Left to right: Reg Harris, Russell Ball, Gabriel Hemery, Mick Boddy, Rupert Bentley-Walls, Martin Gammie. Day 2 The next morning before we left for France, there had been some concerns about port authority security searches and having to bail out the minibus packed with six bikes and loads of kit. But we had a document and tree to deliver and were on a mission. As we came to customs, the official asked us if we had anything to declare, at this point we took it upon ourselves to engage in some banter, which corresponded with him putting on some rubber gloves to undertake a search of the vehicle. The inevitable, ‘I hope you haven’t got cold hands’ comment came from the front seats, which luckily he found funny, and seemed to affect his concentration. Needless to say we were soon safely on our way and bolstered by this success, we celebrated with a hearty breakfast on the crossing studying the route maps for the next leg of the journey, which Mick Boddy had expertly worked out for us. The crossing took about 5 hours, and at Dieppe we were met Anne Jaluzot who was going to cycle the French leg of the journey with us. Anne lives and works in London and is a green infrastructure planning consultant, but is originally from this area of France. Anne was the lead researcher and writer of the TDAG document and was also responsible for translating it into French. As we left Dieppe, we took a wrong turning and ended up climbing what felt like one of the foothills of the Alps! This was going to be harder than I imagined, and was going to be especially so for Rupert Bentley Walls, who was riding a fix wheel bike (single speed). Rupert had only agreed to take part in the ride a week or so before it began, and was nobly deputising for his work colleague- Keith Sacre. Not only was he riding a fix wheel but he also hadn’t done any training- ouch! We soon found our bearings, and started to ride through the countryside. We were able to use the ‘Avenue Verte’, which are traffic-free cycle paths, which follow the route of old railway lines. For those of us interested in pollarding, there was a lot of evidence of this style of cutting in the fields around the villages, primarily of ash and willow. Very sadly, we saw a lot of evidence of Ash Die Back too, and quite large areas ash trees were being felled, and converted in neat stacks of firewood. I’m really obsessed with stacking wood, and these were the first stacks I had seen in France. In my excitement to photograph this, I stopped quite suddenly as were descending another steep hill. I was very fortunate to narrowly escape having an imprint of the renowned author and Chief Executive of the Sylva Foundation, Gabriel Hemery on my back side, and who had been travelling at breakneck speed close to my back wheel, and hadn’t quite appreciated my geeky photographic desires. It was agreed that I would look over my shoulder in future, before stopping so quickly again. 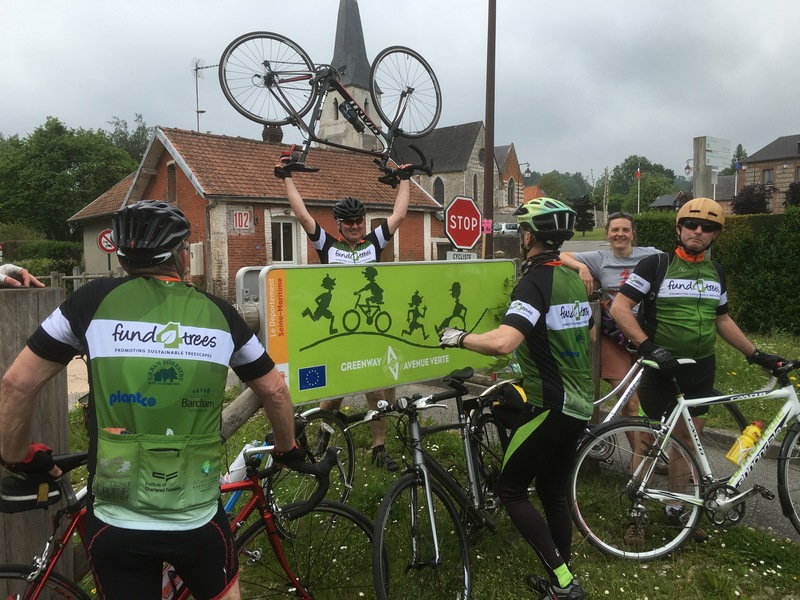 After a break at a roadside café, where the virtuous drank coffee, and the rest of us drank 7% French lager, we completed the last leg of the ride, before our overnight stop at Forges-les-Eaux. Anne’s mother and neighbours met us a few miles before we got to this town, and one of them cycled with us, on a really lovely old French bike. Despite many of us struggling to converse in French, it was really nice to make these connections along the way. One interesting observation we found, is a lot of France is shut on a Sunday (and also large parts of Monday too), so when we got to our accommodation at Forges-les-Eaux, the only place open to eat was the casino opposite! This did have a bit of a ‘Las Vegas in the rural French countryside’ feel about it, but in fact provided really good food. Day 3 dawned, but little did we know what would be in store for us, as we set off for the last 80 mile ride we would do, before we got to Paris. The landscape really opened up here, and we decided to deviate away from the Avenue Verte and follow a roads through pretty little villages and towns. Our first stop proved very successful, and we ate patisseries and drank coffee before the next leg started. We agreed to meet Robin and the support vehicle about 40 miles away, at another café we had been told would be open. Apart from a few energy bars, and Martin Gammie’s endless supply of hard-boiled duck eggs, we were running low on food. Robin was given strict instructions to find some food and water on the way, and then meet us at the café for lunch. It was unfortunate, but because many people work on a Saturday in France and in lieu most places are shut on Sunday and Monday. So when we arrived at the next stop, Robin hadn’t been able to find any shops open, so there was no food, no water, and no café open…….this was very depressing. We ate more duck eggs, then got back in the saddle. Not long after this, it started to rain. At first, it rained lightly, for maybe an hour, but then it decided to chuck it down like a European monsoon for the next 3 hours. During the long grind through the torrential rain, we did eventually find one café open where we manged to get a coffee and a shot of Calvados to warm up, but still no food. We then started to struggle to find our way and knew we had deviated from the official route when we found ourselves cycling through a tunnel under main road, which was normally only used for farm animals! Two punctures later, which Mick ‘Fingers of Steel’ Boddy, expertly fixed in record time, and after some clever navigation (keep the River Seine to your left and we’ll get there), plus Anne being able to ask for local directions in French, we got to our hotel. Boy, were we glad to see it! It’s a good job your skin is water proof, because everything else was completely and utterly drenched. That night, we ate and drank like kings and queens, and even tee-total Rupert, had several beers. 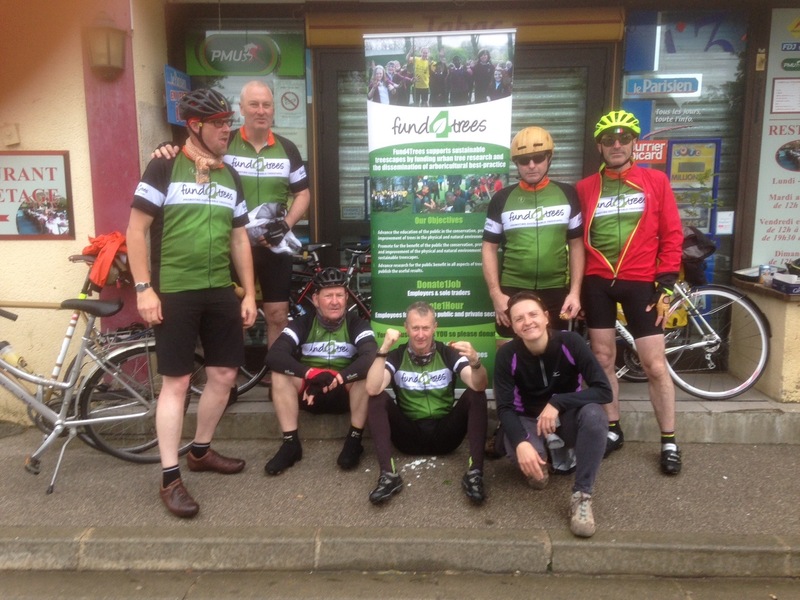 After all, all we had to do the next morning was cycle about 25 miles into Paris…..
Day 4 it was still raining, really hard. We’d struggled to get our clothes dry overnight, and getting completely soaked again for the ride into the Mayors Convention, wasn’t holding a lot of appeal. This ride proved to be quite dangerous at times, as the roads were so wet and it was rush hour. We managed to pick up two more punctures (which ‘Fingers of Steel’ fixed again at lightning speed), and two riders fell off as the conditions worsened. Eventually, after picking our way through the streets we got to the exhibition centre, a bit battered, pretty tired and a lot wet, but, as if by magic it stopped raining, and there was a dawning realisation across the group, that we’d finally made it. Our French sponsor Plantco, met us at the front of the building, and after passing through security we walked through the exhibition centre, in our team cycling colours, and proudly carrying the Oak tree and TDAG document. 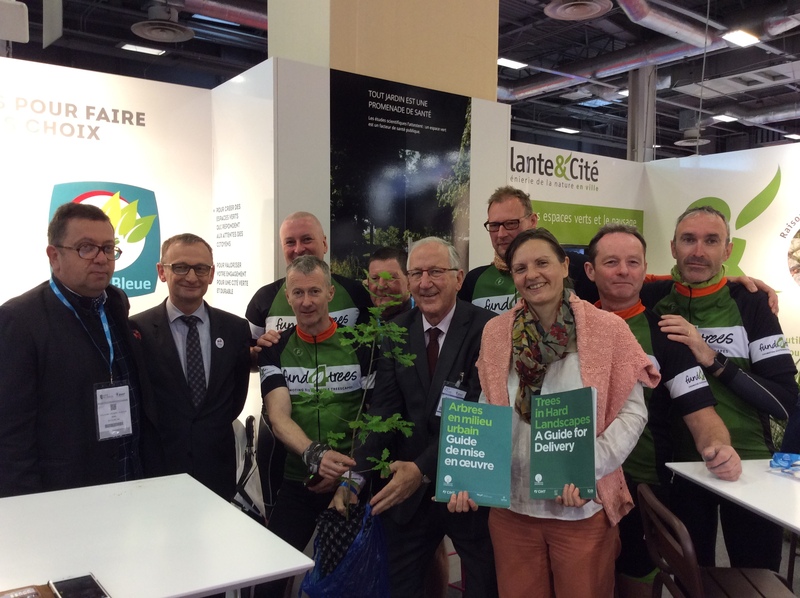 Fund4Trees – London to Paris 2016: at the Mayors Convention in Paris, handing over the special oak and the TDAG report. We were lavished on the VAL’DOR stand with a champagne reception and canapes, and then the Parisian Mayor (who was also the French deputy Environment Minister) said a few words, and officially accepted the French translation of the TDAG document and the Windsor Oak. This was a really special moment, and several of us felt a bit emotional (please don’t tell anyone that). The Parisian Mayor spent a good deal of time with us, and after a few more photographs, we had to head back to Dieppe in the van, to ensure we didn’t miss our ferry. The ride proved to be a superb experience, despite the weather. No one moaned, no one fell out, and apart from the odd quiet moment when the rain was at its worst, we laughed and joked all the way round. Special mention must go to Anne, for her steely determination. She managed to navigate us through the streets of Paris, and cycle over a hundred miles on her Mum’s bike, with gears that didn’t work properly! She didn’t complain once about the weather, despite being utterly wet through for hours on end, and worse, had to put up with 6 middle-aged English men for two days- what a woman! I would like to thank all of the sponsors who supported the ride, and to all of the people who generously sponsored me personally, donating nearly £3000 to my Just Giving page. An incredible amount- thank you. ‘Trees know no boundaries, no creed, no class, no race, and are admired and cherished by society across all walks of life. Our oaks crossed from France after the last Ice Age and throughout time have bound our nation’s history. Indeed, the King Charles II brought many oaks from France to Windsor. It is with great pleasure therefore to carry on a great tradition and to return to France with a sapling grown from a seed from a 1,000 year old oak at Windsor.